This is a sponsored post written by me on behalf of KISS Lashes. All opinions are 100% mine. In my opinion, eyelashes make a huge difference when it comes to elevating your look and enhancing your face. But for me, with my tiny little eyes, my own lashes just aren’t enough to intensify my makeup how I prefer. I’ve tried a ton of different “enhancing” mascaras and none of them do the trick. Plus, I have no interest in getting lash extensions. They take too much time to get on and I’ve heard they can ruin your lashes. Not down for that. So about a year ago, I began playing around with glue-on lashes to find the perfect brand that created a natural yet dramatic look. And after trying all sorts of different lashes, I finally found KISS Blowout! Lashes and fell in love! Eyes truly just POP when you have lashes on. Whether you are going to a special event and have dramatic makeup on or you are keeping it effortless with barely any makeup at all, KISS Blowout! Lashes will make your eyes stand out in a crowd. And because of that, you’ll have people constantly asking if those are your real lashes because they look so incredibly real! The Next Generation Wispy lashes use a unique crisscross pattern that blends seamlessly with your natural lash. And with the KISS Blowout! Lashes, you’ll have a full lash with volume and curl! For me, when I’m not feeling like putting on any eye makeup whatsoever, I simply just put on lashes and I feel put together. And one of my favorite parts about these KISS Blowout! Lashes is that you seriously cannot feel them. So often lashes feel heavy and almost uncomfortable and you’ll find yourself excited to get home so you can tear them off. But not with KISS Blowout! Lashes. These Blowout lashes are lightweight, super soft, and incredibly comfortable. I wore my almost every day over the weekend and often forgot I had them on. I’ve been wearing the Pageboy regularly because they look so natural while still enhancing your eyes and giving your lashes way more volume! 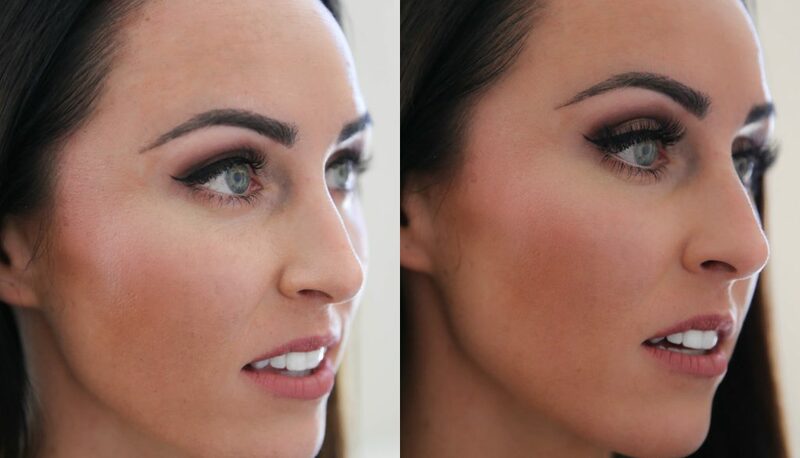 Use the Beehive lashes for more depth and definition or try the Bouffant for going out in a smoky eye look! But no matter which lash you wear, you’ll feel comfortable all day and all night in them! If you’re a person who has had trouble putting on lashes in the past, not to worry, I did too when I first started! It was a bit of a nightmare. But that probably has to do with the glue. And now that I’m using KISS Strip Lash Adhesive, I’ve had no issues whatsoever! The glue goes on with a swipe of the brush and it becomes tacky in just 30 seconds, then you can start putting it onto your lash line. The adhesive goes on clear ones it dries so if you miss your lash line at any point, you won’t have glue marks showing up all over your lid. What seems to work the best for me when putting on my lashes, I start with putting a mirror below me so I’m looking down. Remember, depending on the size of your eye, you may need to cut the lashes smaller. I cut off just a little bit to fit my eye just right. Then once I put the glue on and it becomes tacky, I use tweezers to place the middle of the lash in the middle of my lash line then work my way out to outside of my eye, pressing down with the tweezers. Then I finish with pressing the lash into my lash line, moving towards the inside of my eye. I’ll often use the back of my tweezers to press down on the lashes to help them stick ever so slightly. Then I’ll use my fingers to press the lash down into my eye. The glue really does most of the work, but this makes sure everything is in place! It’s really that easy! And it gets easier the more you do it! Some people prefer holding a mirror above eye level, but having the mirror below has helped me so much because it gets your lashes out of the way and makes application easier, in my opinion! It may seem a little intimidating at first, but the KISS Blowout! Lashes along with their adhesive make application super easy. You can see the Pageboy lashes I used on myself below and how they look incredibly natural while simply enhancing my own lashes. These lashes will give you volume and truly make your lashes POP!! If you’re still trying to figure out if glue-on lashes are for you, give these KISS Blowout! Lashes a try and you’ll be hooked! I really do feel my most confident when I have lashes on and since I can put these on in just a couple minutes, I have no excuse not to wear them everyday! I think these lashes will become my new wardrobe staple this summer! Don’t forget to follow KISS Blowout! Lashes on all their social media channels so you always see all the new products they offer and get some lash and makeup inspiration! love the look of false lashes.. hate putting them on! Where did you get that mirror? looks like perfect size for looking down to apply. What do you use to remove the glue? from the eye or the lashes itself? Can you sleep in them or do they have to be taken off each night? Do you have to purchase the glue separately or does it come in the box with the lashes? One more question tacked on: can you work out while wearing these lashes?